ALICE: Two days ago you came to this city and you didn’t know anyone: you didn’t know me and I didn’t know you; and now we’re married. Now, we both know that that was meant to be. So, don’t you see, whoever makes the arrangements for people is doing pretty well for us. CÉLINE: It’s like our time together is just ours: it’s our own creation. JESSE: And what’s so cool is that this whole evening - all out time together - shouldn’t officially be happening. Vincente Minnelli's 1945 WW2 Hollywood romance The Clock, and Richard Linklater’s 1995 ‘independent’ romance Before Sunrise are very different films, separated by fifty years. But they also contain enough similarities to make them interesting companion pieces - so much so, in fact, that Linklater reportedly showed the earlier film to his two leads in preparation for the shooting of his film. The former tells the story of a G.I. (Joe, played by Robert Walker) on leave in New York, who falls in love with and marries a young woman (Alice, Judy Garland) over the course of a single weekend, at the end of which he returns to war. It is an extraordinarily sweet and beautifully simple romance - the kind that many audiences now might thoughtlessly dismiss as being entirely unbelievable and naïve, but which has far more charm and feeling to it than the majority of contemporary romantic comedies. The later movie tells of a young American man at the tail-end of an inter-railing trip around Europe (Jesse, Ethan Hawke) and a young French woman on her way back to Paris (Céline, Julie Delpy) meeting on a train, getting on well, and deciding to embark on a day’s walking round the streets of Vienna; during the hours they spend together they seemingly fall in love, but are forced to leave each other the next morning, promising at the last minute to meet again in Vienna six months later. The aspect of each film that I want to look at here is its apparent attitudes towards the notion of fate - specifically the idea of fate as something that controls love. It is a long-perpetuated convention of romance and romantic comedy that, not only will the love the film’s two protagonists feel for each other at its end survive, but that it will survive because it is fate that has brought the lovers together. Apart from anything else, this convention means that the audience understands the characters to not have full control over their destinies. The dialogue quoted above is indicative of The Clock’s and Before Sunrise’s feelings about fate: the earlier film seems to have a strong belief in it - and suggests that Joe an Alice’s love is “meant to be” - whereas the couple in the film made fifty years later pride themselves on the fact that their meeting has not been predestined - that their love is their “own creation”. Of course, the concept of fate is one that lends itself well to the plots of fictional narratives (it can explain away moments of chance without making them seem arbitrary), and has particular value for the fiction film due to the need for that narrative to be told in an especially finite space of time. What I hope to suggest in this article is that, in The Clock (and, arguably, in many romance films more generally) “whoever makes the arrangements for people” can often appear to us to be the film itself, moving its lovers towards an inevitable, fated, union. In so doing, I also wish to suggest a connection between the fate controlling the characters in Before Sunrise and The Clock, and the level of control imposed by each film on its audience. It was commented on at the time of its release that The Clock was a film that seemed to bring together its protagonists by fate. The contemporaneous critic James Agee said of Joe and Alice’s romance that, “Almost against their will, they come to suspect that they are in love”. The same could be said of countless couples in countless Hollywood romances: from It Happened One Night (1934) to Pillow Talk (1959) to When Harry Met Sally (1988), the list of films in which the central couple begin the film certain that they will not fall in love and - reluctantly - finish as lovers is endless. It is not that the couples in these films begin as enemies that is important to The Clock (for, excluding a brief misunderstanding regarding the heel of Alice’s shoe, which momentarily suggests screwball sensibilities, Minnelli's couple could never be described in such terms), but rather the fact that their eventual union is, as it were, imposed upon them - that it seems to be, Agee says, “against their will”. It is not Joe and Alice’s own wills that lead them into each other’s arms - it is something else. ALICE: Think of all the people in this city all around us. All the people in the country. All the people in the world… And out of all that, just… those stars… And you and me down here together. It’s strange isn’t? JOE: I don’t know… It doesn’t seem strange anymore. JOE: We couldn’t not have met. JOE: That was part of it. […] There were other things, like your leaving home, my being in the army, getting leave just when I did - that’s all part of it. Indeed many things, people, and events form part of “it”, working towards bringing the pair closer - often physically - during the film: Alice’s shoe needing repair, a lighter that Joe gives Alice, a milkman’s van with a too-small seat that forces them to sit close to one another, a judge’s secretary who turns out to be the cousin of the milkman and helps them get married, and so on. Time and again New York pushes them together in some scenes, separates them in others. But it is, of course, not only a helpful city, but also a very helpful, and meticulously-constructed, script that is forcing them together and moving them apart through a series of scenes and set-pieces. This means that their eventual union literally is inevitable because it is preordained by the narrative - the “it”. Of course the same is ultimately true of any cinematic fiction. Yet Before Sunrise is a film that, even though it is controlled by the same inevitability of outcome, does not feel as if it is - at least not to the same degree. I will try to explain why. In his essay, ‘Before Sunrise: Rethinking Romantic Love’, Robin Wood says of Jesse and Céline that “the relationship shifts and fluctuates, every viewing revealing new aspects, further nuances, like a kaleidoscope… They involve the audience in a complex, personal dialogue: Do you feel this, do you agree with that, how does this affect you?” The same can be said of the film itself, concentrating as it does almost entirely on the couple, meaning that, as our feelings about the lovers change, so do our feelings about the film as a whole. It is this “complete openness”, this sense of emotions and reactions being comparably undetermined and potentially changeable - both in character and audience - that gives the film its almost existentialist sense of free-will. 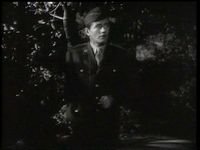 In his review of the film in Film Comment, Robert Horton suggests that, “instead of entwining the characters in something like romantic destiny, they more often seem to be playing out idle curiosity”. Although I would argue that “idle” is not quite right (the “curiosity” they feel quickly becomes intense passion, and finally desperation), it is absolutely true that, unlike The Clock, it certainly feels that it is they who are doing the “playing out”, as opposed to it being they who are being played. This feeling is created partly by a distinct lack of ‘plot points’ that act on them to bring them together. Once Céline and Jesse have found themselves sitting across from one another on the train and decide to leave together, the rest of the film consists essentially of a series of episodic scenes, during which they talk themselves - rather than move (or become moved) - into each other’s arms. The focus on speech, rather than on action, gives the characters a particular sense of autonomy. As John Wrathall says in his Sight and Sound review (being, admittedly, far too sweeping about the history of American cinema): “Perhaps uniquely for an American film, Before Sunrise is about people who are attracted by each other’s minds rather than simply by looks, or by that elusive movie concept, ‘chemistry’”. Because we have come to know them through their unceasing dialogue, when Céline and Jesse first kiss in the Prater we know it is because they are ‘right’ for each other psychologically and emotionally - not because they are the two main protagonists in a romance film, and therefore must form a relationship because they are, as Alice puts it in The Clock, “meant to be”. I should make clear at this point that I am not arguing that Joe and Alice aren’t right for each other on a psychological or emotional level (their early dialogue suggests that they relate to each others’ small-town backgrounds, for example); rather I simply trying to show that this is certainly not the main reason that we - or, for that matter, they - know that they ‘belong’ together. I will now draw a parallel between the level of fate that appears to be controlling each characters’ lives and the control implicit within each film’s construction. In order to do this I will compare two sequences that I think manage to implicitly illustrate their films' attitudes towards fate by imposing varying degrees of control on both their characters and their audience. I consider these two scenes especially comparable since it could certainly be argued that they are the first in each film to give their audience that familiar, palpable, sense that it is perhaps the ‘right’ time for the couple to share their first kiss. In The Clock this expectation is gloriously fulfilled, whereas in Before Sunrise the urge for union is resisted. The sequence in The Clock takes place in the Central Park night scene and follows the exchange between Joe and Alice regarding fate. As the two of them listen to the sounds of the city, wandering around their clearing with their ears cocked, they walk slowly, disconnectedly, almost as if hypnotised, into their first kiss, whilst George Bassman’s score finally swells and climaxes loudly. From the first shot of the sequence, which frames Alice sitting in the bottom-left foreground and Joe in the top-right background, we feel that the space in between them - the middle of the screen - must and will be eventually filled by their embracing bodies. This does happen, and happens in a highly structured fashion. Alice initiates the pair’s reverie by saying “The city’s full of sounds, always underneath - listen,” tilting her ear whilst framed in a medium-long shot. We then cut to Joe, also in a medium-long shot. Apparently guided by the sounds he is craning to hear, he takes a couple of steps forward then stops, now framed in a medium shot. We cut back to Alice and the action is repeated, mirroring the previous shot: listen, move, stop - medium shot. This pattern is repeated again, moving the characters gradually closer to the camera (and therefore each other) in each shot, then cutting back to the other and doing the same. Eventually, Joe spins all the way round, steps forward, and is framed in a medium close up. At this point the pattern is broken: as the music climaxes, Alice enters his close up, throws her arms around him and places her head on his shoulder. Quite apart from the highly improbable sound effects (they are, for one thing, far too loud) that seem to guide the couple towards one another, their movement is - and feels - highly choreographed: or, in other words, controlled by an outside force that is determined to bring them together. The sound effects are gradually drowned out by the strains of the score, meaning that the couple are increasingly made to seem as if they are listening, not to the sounds of the city, but rather to the strings and choir we now hear. In fact, the scene strongly echoes that most gloriously choreographed of all genres: the musical - the two protagonists enacting the dance of their first union. This is perhaps unsurprising when one considers that The Clock was the first non-musical film that Minnelli directed, which becomes important when one looks at the highly prominent use of music in the scene. The aforementioned James Agee, who shares with me a love of this scene, does nevertheless express his dissatisfaction with its overbearing use of the score when he says, “with the dirtiest and most merciless kind of efficiency, a full orchestra a hyped-up soprano are working at you below the belt”. What he objects to is clearly the way in which the score forces the audience into feeling emotion. This is, however, in my opinion, absolutely appropriate: in the same way as the lovers are being forced into each other’s arms by the sounds they hear (and by the film they exist in), we are being forced to emote by the music we hear (provided, we know, by the film we are watching). The shot construction, the choreography, and the music all here impose the same degree of control, the same sense of inevitability, on the audience as is being experienced by the characters. The formal aspects of Linklater’s scene also mirror the amount of fate (or lack thereof) acting upon its characters, by imposing as little control on the audience as possible. The scene takes place in the listening booth of a record shop that Céline and Jesse have entered in order to listen to an album of Céline’s choice. 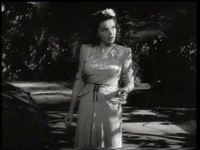 All that happens during the scene is that the characters stand still and listen, somewhat embarrassedly, to the rather too-appropriate love ballad (“I’m not impossible to touch/ I have never wanted you so much/ Come here…” the female singer coos), either looking at each other or not, their eyes never meeting. The whole scene takes place in one shot - uncut for 1 minute, 7 seconds - and therefore cannot direct our eye through editing; nor does it do so by camera movement (the camera is static), or by framing (the shot is a straight-on two shot of the couple, the amount of space occupied by each character virtually identical). We thus have as much free will here as Céline and Jesse: we may look at whichever character we choose, able to roam the frame at our own leisure in the same way that they roam the city, their lives, and - seemingly - the film at theirs. In terms of our emotional reaction being conditioned, it could be suggested that the song being played (Kath Bloom’s ‘Come Here’) serves essentially the same function as the score in The Clock. Although this is true to an extent (we have no choice but to hear it, and it certainly conveys a particular mood), the fundamental difference is that the music in Before Sunrise exists within the actual world of the film, and is provided intentionally by the characters themselves. It is their will that the record should be heard. They are thus creating their own soundtrack, as it were, rather than having one created for them and it acting on them to bring them together. This means that, if we feel manipulated, we are in a sense being manipulated as much by the characters (and can share in their amusement at how unintentionally apt the song is to their situation), as by the film or its director. Of course, again, this is not in fact strictly true: clearly, it is Linklater who has decreed that this song plays at this moment, just as it was Minnelli who oversaw the use of music in The Clock. Yet what is important here is the difference in effect: though in truth Before Sunrise's lovers are as much pawns in this scene as Joe and Alice are in theirs, this is the opposite of how the moment is made to feel. The Clock, then, attempts to give us as little control over our emotional response as Joe and Alice have over their pre-determined love for one another; Before Sunrise, on the other hand, gives the viewer the possibility of being as free from control as Céline and Jesse are free from fate. This happens throughout each film. 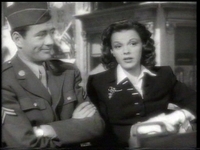 Whereas Minnelli consistently has his characters step into close-ups, controlling them, and us, through the film as much as any character in a Meet Me in St. Louis (1944) musical number, Linklater’s camera more often tends to follow its characters with the same free-wheeling independence that characterised his truly democratic, protagonist-free debut feature, Slacker (1991), which introduced us to new characters every few minutes simply by having them walk in front of the camera, its view then following them. Linklater’s constant use of long takes - either with a static camera, or with movement determined by Hawke and Delpy - allows the actors to appear to be relatively free and spontaneous. Both narratively and formally, The Clock feels always as if it is moving towards an unambiguously known goal, its characters and audience being controlled by a higher power - the film. Before Sunrise, on the other hand, depicts a world in which it is suggested that both character and audience have a great deal more free-will. Both films end when their couples are forced to leave one another: Jesse must return to America, Joe to war. When Joe departs at the end of The Clock, we are likely to be as certain as Alice is that he will return; when Jesse and Céline part at the end of Before Sunrise, we are nowhere near as confident that their six-month-ahead reunion will be kept. If there is a reason for this it is partly because we have been shown that one relationship has fate on its side (and therefore, according to convention, cannot fail) and the other does not. The final shot of Minnelli's film begins on Alice walking away from Joe’s train, then cranes up and away, further and further back, until she is lost in an extreme long-shot of Grand Central Station. We are thus presented with a God’s-eye-view: a God who, like a film director, has a plan, controls the crowd, and “makes the arrangements” for everyone - including us. Before Sunrise also ends on its female protagonist, but, rather than pull out, the camera tracks slightly in to a medium shot of Céline as she falls asleep on the train that is taking her away from Jesse. By filling screen time with their talk, and even occasionally directing camera movement themselves, Linklater’s lovers have been made to feel as if they are their own screenwriters and directors. Their romance has indeed to a great degree been their “own creation”. It is fitting, then, that the film’s final image, rather than being of an all-encompassing crowd, is simply a medium shot of a character who, unlike Joe and Alice, but rather more like us, creates her own destiny. This article was published on January 03, 2008.